The art center, Art Works Downtown is such a stimulating place to have a studio, especially one right down the hall from the gallery – you can see the “Ann Brooks” shingle just above my door on the right. 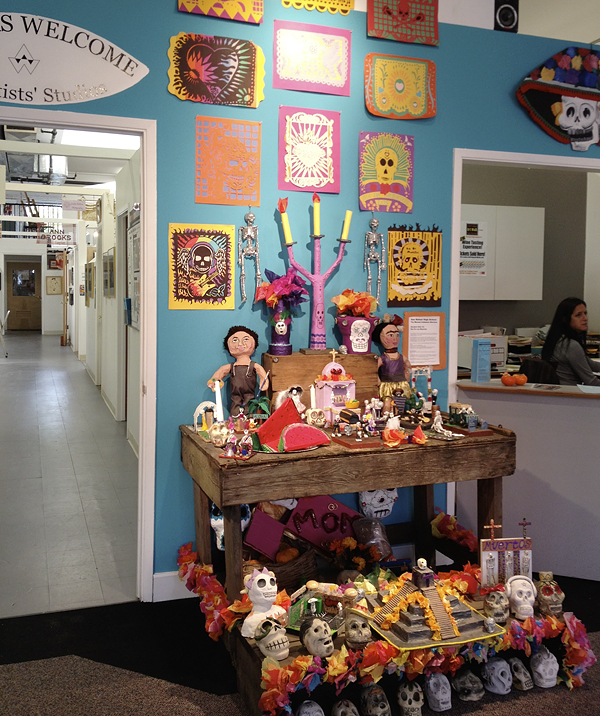 The communal altar above was created by students at San Rafael High School. Detail is below, left. 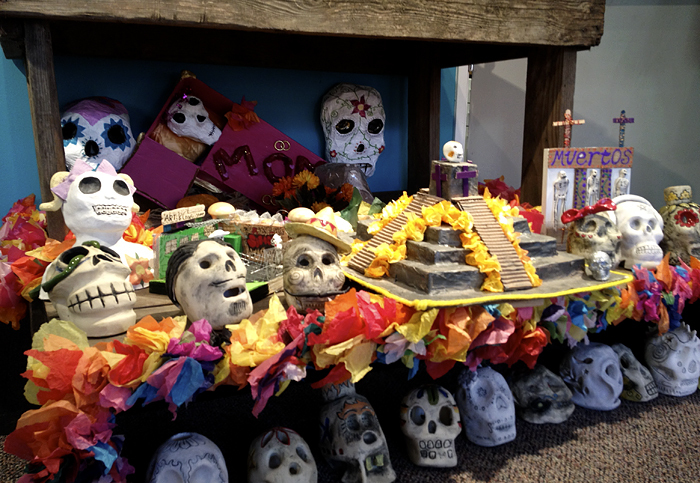 This selection of Day of the Dead altars is from both groups, as in the case of the San Rafael High students and individual artists or general public who wish to honor departed friends and family members. 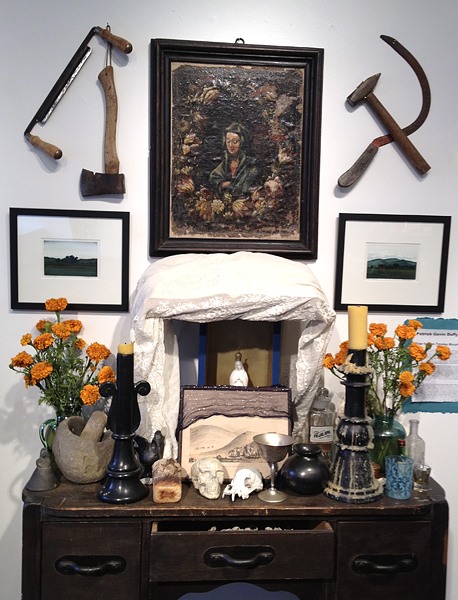 Several of the altars honor the people of San Rafael of the past as well as early settlers like Don Timeteo Murphy. 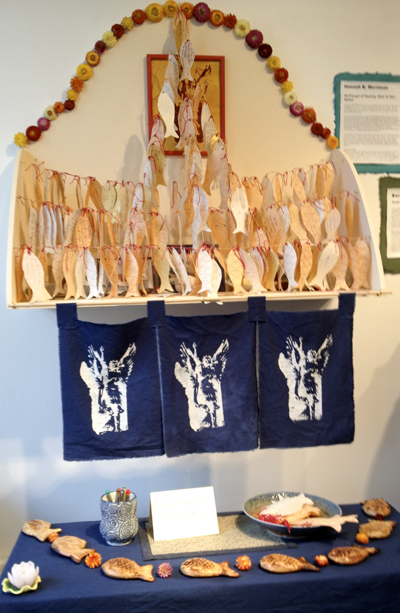 The exhibition was juried by Sharon Christovich, Folk Art Gallery owner, and Carol Durham, Art Works Downtown studio artist. Above and right, an altar which invites the public to write their own wishes, prayers for people dear to them – see the detail below on the left. 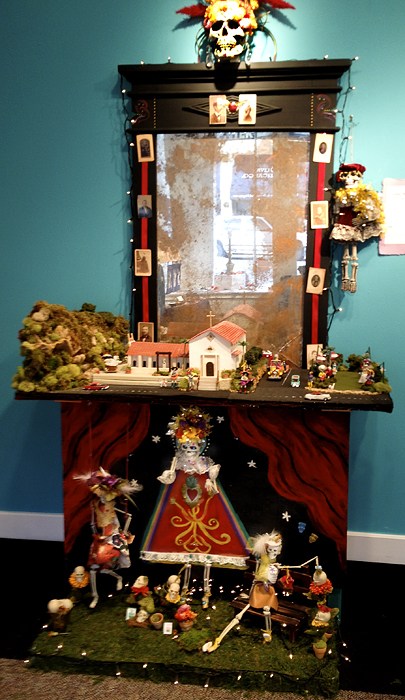 The altar directly below by Petrina W. was given the Jurors’ Award. In it she pays homage to so many friends and relatives she has lost. She writes about them with such elegance that one ends up breathless over the losses she has suffered, yet wonders at her open, friendly personality! 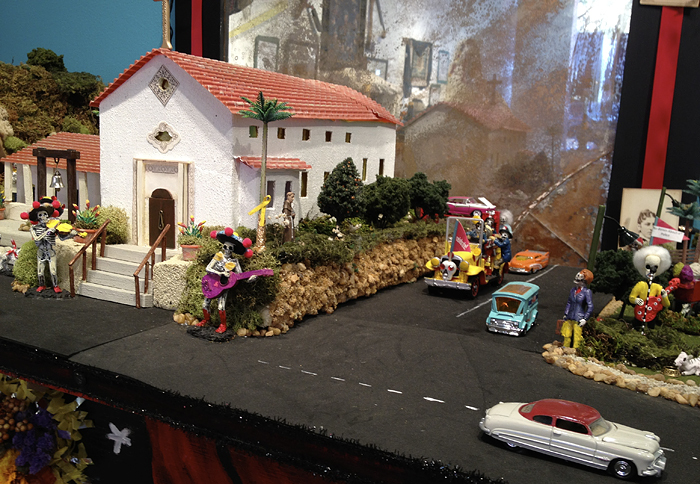 To the left, Patrick Gavin Duffy has created an altar honoring one of San Rafael’s earliest founders, Don Timeteo Murphy, the legendary six foot, 300 pount, red-headed Irishman who was granted the “Rancho de las Gallinas” and most of the former mission lands by the Mexican Governor. This altar references items from the Rancho period when this western edge of the ‘world’ system was Spanish, not American. Fine Arts Department student at College of Marin, Novato. 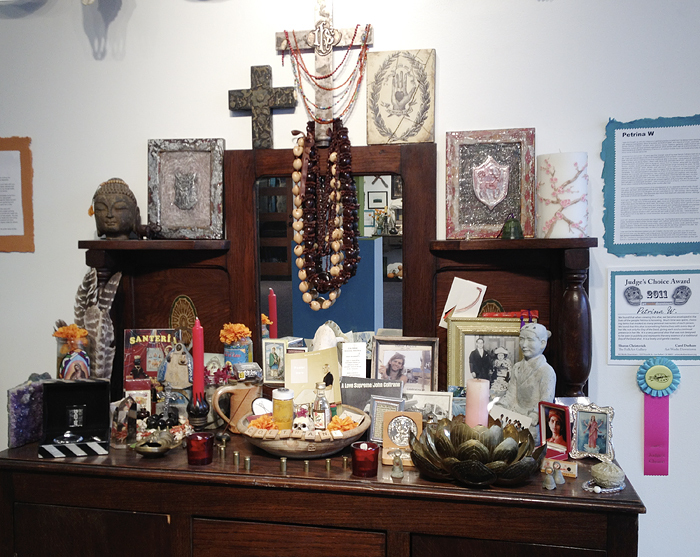 Isabel Hayes’ altar “Home is Where We Rest Our Bones” is a memorial dedicated to the people of San Rafael, then and now. Isabel calls San Rafael her home. Friday, November 11th Art Walk will be the closing reception for this very stimulating show. All photos by Ann’s iPhone 4s with post production in Photoshop. 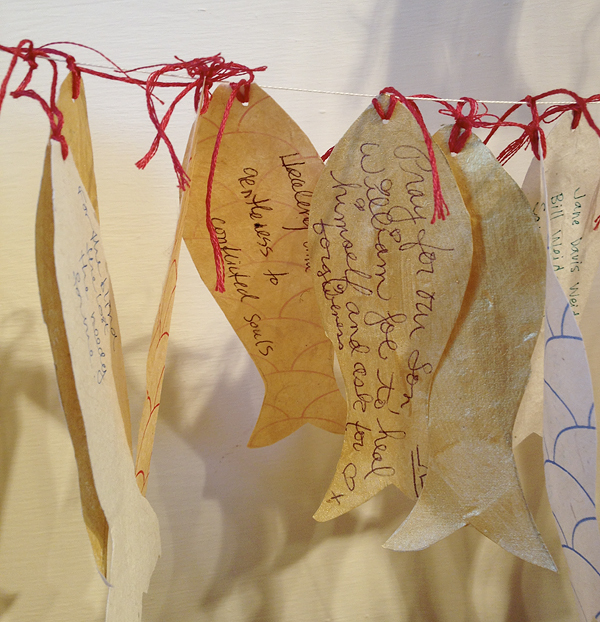 Above: detail from “Home is where we rest our bones” by Isabel Hayes. … and more in my Art Works Downtown studio or at my online shop.